Three strapping lads, who go by the guise of ‘The Pretend Men’, stride into the Slung Low theatre in little more than cowboy hats and unbuttoned shirts. 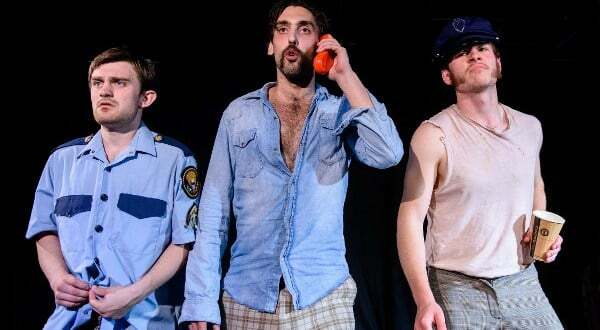 With seven awards under their belts already, Nathan Parkinson, Zachary Hunt, and Tom Roe, have been touring around the world as notorious cop/drug lord/renegades for over a year now—and they’re still as fresh as ever. From the moment they enter the stage, the energy ‘The Pretend Men’ emit is super-charged, as if it’s psyching them up to continue at full speed into the next hour of performing. Their slap-stick, panto comedy style is initially off-putting and feels over-done, but once you catch up with them as an audience, this unexpected approach works well with the rapid tempo of the piece. Not only is their shows name adopted from a fictitious tv show within The Simpsons, but it also mimics the cheeky, boundary pushing humour that The Simpsons has always managed to achieve relatively tastefully. Set in the late 70s (a time before regimented political correctness), Police Cops is a full-throttle, Starsky and Hutch style, cinematic parody, reminiscent of every Cowboy or Cop show you’ve ever seen. It follows the journey of a strait-laced kid attempting to be “The best damn Police Cop…EVER!” in the face of corruption, vagrancy and just a little man-love. Jimmy Johnson and retired vagrant cop Harrison take to the mean streets to rub up some criminals the wrong way, but inevitably save the day. It’s trashy, for sure, but oozes talent in a balance of impeccable acting, meticulously timed jokes and perfectly synchronized choreography. Despite a somewhat excessive use of props, these lads utilise everything they have: musical talents, brute strength and longform improvisation tactics that would make Del Close proud. Transitioning between costumes, scenes and props as slick as gasoline on water to create a plethora of characters and every adventure scenario under the sun. The relatively small stage and close audience proximity of Slung Low works in favour of such an intense production. The actors are heavy on facial expression, and in several instances, all three succumb to their own jokes, unable to stifle a cheeky smirk. A forgivable offence, as this only adds to the rapour they hold with their audience and shows a distinct enjoyment of performing. For anyone from hen parties to theatre fanatics, ‘The Pretend Men’ are worth your evening. With the array of talents they display in Police Cops, I have no doubt that whatever they come up with next will be just as engaging. Definitely ones to catch if they roll up in your town. Three strapping lads, who go by the guise of ‘The Pretend Men’, stride into the Slung Low theatre in little more than cowboy hats and unbuttoned shirts. Set in the late 70s (a time before regimented political correctness), Police Cops is a full-throttle, Starsky and Hutch style, cinematic parody, reminiscent of every Cowboy or Cop show you’ve ever seen.